Yet, there are still various points of interest I would like to talk about. First off, let’s talk Val Kilmer, who plays a character named Angel. One thing that bummed me out about the clips below is they pretty much give the whole movie away. They reveal plot points that I don’t feel should have been spoiled the way they were. We will go over the clips in a moment. The list is endless with “Top Gun,” “Heat” and “Tombstone,” but I would like to point out another performance that really impressed, and one I feel is highly underrated: “Wonderland.” This movie was amazing to me. I remember going in not expecting much, and being blown away by both Kilmer’s performance (and also that of Kate Bosworth). With a history of movies, like this it is easy for me to admire this actor, so when I heard about this movie with him and “50 Cent,” I couldn’t help but get my curiosity piqued. One final note: This movie also stars Danny Trejo (“Machete”), who has recently been all over and impressing, but sadly his fate in this movie is ultimately spoiled in the clip below. 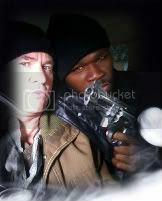 In the first clip, Detective Rogers (James Remar) wants Angel (Val Kilmer) to give some answers, so they are using scare tactics in hopes he will rat out 50 Cent’s team of gun-runners. In this next clip, Rich welcomes Angel to the team. I must admit 50 Cent does seem to be into his part and demonstrates his acting potential in this clip. In this next clip, Rich is trying to make a deal (this is the scene with Dany Trejo), but things don’t go as planned. Plenty of shooting and cursing, too. This is a pretty cool clip where we find Rich showing a client some his products. He fires off this amazing gun; I was sold and finally understood why “Gun” is the right name for this movie. In the final clip, Detective Rogers is upset with Angel about some misinformation. After watching these clips, I feel like I have watched the whole movie. I probably will eventually check it out, but I will try to let some time go by. Don’t get me wrong, the movie does look interesting and all the actors do seem to take themselves seriously. So, what do you think? Would you watch this movie if all the characters involved brought in their “A” game? Sound of in the comment section. What happened to Val Kilmer? Woah!